Angela thinks she knows her boyfriend Vince pretty well, that is until he goes missing. She quickly learns he has a hidden employment, his boss the infamous London crime lord Frederick Meloy (known as Fat Frederick, but nerver, ever as Fat Freddy). His secret job? tracking down arcane relics succh as gryphon claws, satyr horns and other mythical creature body parts. As Angela tries to piece together where Vince might be she begins to uncover bizzare, hidden, deadly underbelly to London that is beyong imagining. 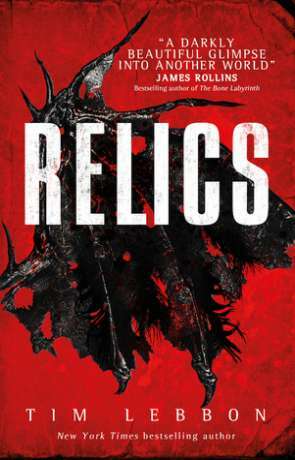 Tim Lebbon's prose is often evocative and always gripping, Relics is no exception. While an urban fantasy detective novel is hardly original, the way he handles the protagonists and the dark underworld of angels, demons and all the supernatural creatures inbetween feels fresh and different. He creates an atmosphere that borders on horror - just shying short of the shocks that would turn it into a horror novel. It's dark and dirty fiction that brings the fantastic down to earth. The first part of the book is dedicated to setting up the main protagonists and their relationship. It felt a bit slushy for my tastes, describing in some detail just how much Angela and Vince love each other. It's worth pushing past this soppiness though as when it does finally get going an interesting story unfolds, enveloped in a wonderful dark ambience which reminded me of Gaiman's voice in places. It also becomes clear why the author devoted time in describing how close the couple are. Why else would Angela go to such lengths to rescue Vince if not for the strong connection they have? We else would she jump down the dark rabbit hole of broken and twisted creatures. This method of setting up the characters works effectively but I can imagine people giving up before it really gets interesting. I loved this hidden London, I know its been done many times now but the author does a cracking job of creating a living, breathing, secret universe. The story fits in well and the characters act as the glue joining it all together. Overall Relics is a promising start to a series that could become something quite special. Written on 8th February 2017 by Ant.